Allen Tate Realtors® will host a grand opening celebration and ribbon cutting at the company’s new Wesley Chapel office on Thursday, January 14, 2016, from 5 to 7 p.m. The new office is located in the Village Commons Shopping Center at 6330 Weddington Road, Suite 2A, in Wesley Chapel. As part of the event, the office is collecting gently used coats for WSOC-TV Steve’s Coats for Kids, for distribution through Crisis Assistance Ministry. The drop-in event is open to the public and reservations are not required. Attendees are invited to tour the office, meet Allen Tate Realtors, enjoy refreshments and register to win prizes. “We’re excited about our new location in Wesley Chapel and we want to show it off to our clients and the community,” said Wendi Hensel, Wesley Chapel branch leader. 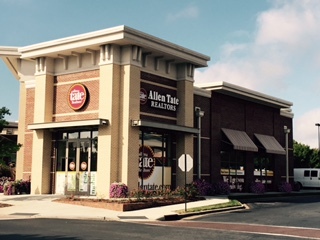 The Allen Tate Wesley Chapel office opened in September 2015. The retail center office is a flex space, catering to various work styles of up to 25 Allen Tate Realtors® and staff, including those who prefer to work on the go. It features an open floor plan, private offices, video displays and conference space. For more information or directions, call 704-234-5322.